We've got a large variety at the lowest prices in the area! All your favorites as well as a large selection of craft beers, spirits, and wine, including South Dakota's own Prairie Berry Wine out of Hill City. 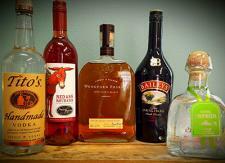 Stop in and grab your “ol' stand-by” or mix it up and try something new. Let our knowledgeable staff help you select something you'll love. You can also check our wine pairing tab right here on our website!